A successful military force needs specialized soldiers of all stripes to support the main vanguard. It needs shock troops to break the enemy lines and push an advantage, heavy artillery to bombard the enemy position, and skirmishers to harry and distract. The Rebel Alliance is no stranger to the realities of war, and there are few warriors more specialized and deadly than the Alliance Rangers. Well known for accompanying Han Solo to Endor as part of his elite strike team with a mission to deactivate the shield generator, the Alliance Rangers are the consummate long-range fighters. 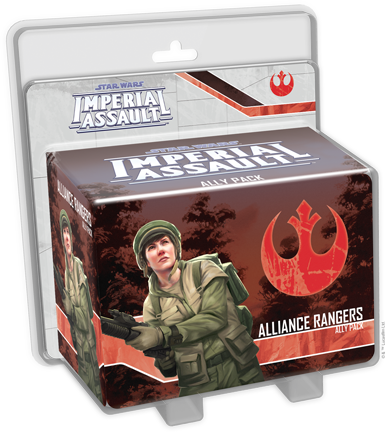 Now, with the Alliance Rangers Ally Pack for Imperial Assault, you’ll find three carefully sculpted Alliance Ranger figures, new Deployment cards and Command cards, and new missions for the campaign and skirmish game, inviting you to wage guerrilla warfare in the Star Wars galaxy. Today, we’ll join the Alliance Rangers hiding in the underbrush and line up a shot to take down the Empire! 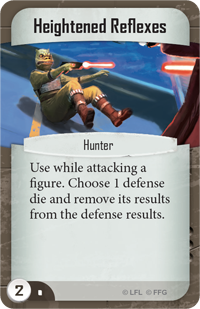 In a game of Imperial Assault, many figures boast ranged attacks, allowing them to strike from relative safety. At longer ranges, however, these attacks can quickly grow unreliable. You can’t just set up your attacks and count your damage. You also need to roll enough accuracy to reach the target. Even ranged fighters are sometimes best off when they make their attacks from only a few spaces away. If any unit excels at striking from long-range, however, it’s undoubtedly the Alliance Rangers. To start, these figures roll two blue dice and have an inherent accuracy boost automatically built in to their attacks. The sum of these facts is that even at a range of five spaces away, your attacks have zero chance of missing due to accuracy. Of course, that’s not the limit of the Alliance Rangers’ effectiveness. The maximum accuracy on a single blue die is five, which means your attack could reach up to eleven spaces away! Even if you’re only six or seven spaces away, most melee characters won't be able to move and attack you in a single activation. And of course, you’ll also have the option to spend surges during your attacks with the Alliance Rangers, dealing more damage, piercing armor, or increasing your accuracy even further. The Alliance Rangers also boast two abilities that cement their identity as long-range skirmishers. First, they have the Sniper ability: while attacking a target that’s five or more spaces away, you can reroll an attack die, giving you much better odds of dealing the damage or gaining the accuracy you need. Then, once you take down your mark, Guerrilla allows you to become Hidden after defeating a figure with your attack, keeping you safe from enemy ranged fire until your next attack. For truly dangerous missions, you may choose to field the elite version of the Alliance Rangers. 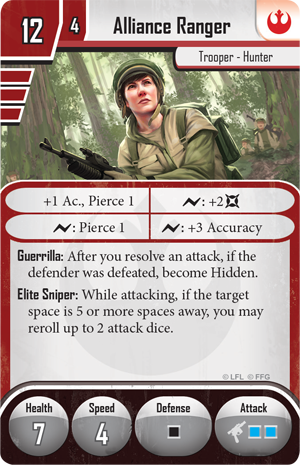 These highly trained soldiers cost only three extra points, but they gain an inherent pierce bonus and an increased potential to surge for accuracy. In addition, the Sniper ability is replaced with Elite Sniper—now, if the target is five or more spaces away, you can reroll two attack dice, instead of just one! With your attacks becoming that much more consistent, elite Alliance Rangers are renowned for bringing down their targets from any distance. 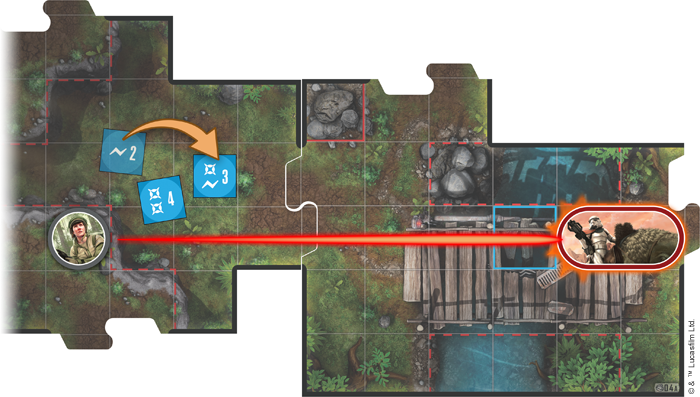 The Alliance Ranger targets Captain Terro from eight spaces away, and uses her Sniper ability to reroll a die. Combined with the Ranger's inherent accuracy boost, this is enough accuracy to hit her target! During your campaign games, the Alliance Rangers are perfectly suited to providing covering fire for your advancing heroes. Even as the heroes advance towards their objectives, your Alliance Rangers can harass the Empire’s troops from afar, forcing the Imperial player to choose between enduring these attacks or diverting valuable resources away from stopping the heroes. This Ally Pack also includes a brand-new side mission for your campaigns, which challenges you to infiltrate an Imperial base hidden deep in an Ithorian swamp. The base is heavily protected, as you might expect—but fortunately, you’ve got a team of Alliance Rangers willing to cover you throughout your mission. If you can successfully help them complete the mission, you’ll win their respect and be able to call upon them as an ally in a future campaign mission! As you might expect, the Alliance Rangers can form a dangerous addition to your skirmish strike team as well. Though not every skirmish mission features the long firing lanes that Alliance Rangers excel with, they can certainly serve a key role in covering your other soldiers. In most cases, you won’t want to throw your Alliance Rangers into the unpredictable mayhem of conflict, but by staying back and firing from long-range, they can easily throw a wrench into your opponent’s schemes. The Rebel Alliance isn’t the only faction with something to gain from this Ally Pack, however. Within, you’ll also find a new neutral skirmish upgrade— Survivalist. Survivalist can be attached to any Hunter or Trooper, and while the Alliance Rangers could be a natural target, they aren’t the only one. Then, a unit with Survivalist attached can ignore any additional movement point costs from moving through difficult terrain and hostile figures! Because it allows you to move freely through hostile figures, Survivalist may even be best suited to a figure group that you want in the midst of combat, moving freely through your foes and cutting them down in their tracks. Survivalist even lets the attached figure recover a damage at the end of each round, so long as it’s in an exterior space, potentially helping you survive in the face of your opponent’s attacks. 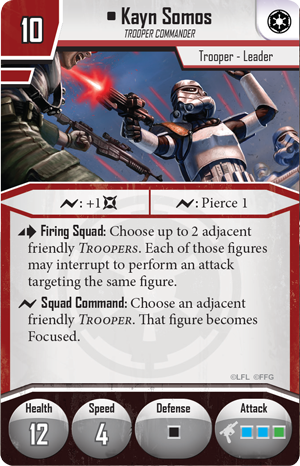 The Alliance Rangers already have plenty of ways to line up the perfect shot and stay out of enemy sight, and with the three new Command cards included in this Ally Pack, you’ll find even more options. Heightened Reflexes can be used whenever you’re attacking a figure to remove the results of a defense die after it’s rolled! In other words, you can wait to see if your opponent rolls a dodge, and if he does, you can use Heightened Reflexes to negate it. 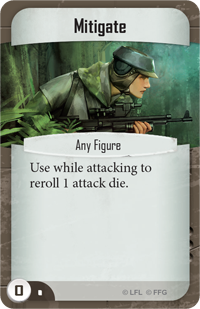 On the other hand, if the problem lies with your own attack dice, Mitigate can be used by any figure to reroll an attack die, giving you better odds of getting the damage or accuracy that you need. Finally, your higher-costed Troopers can take advantage of Call the Vanguard. 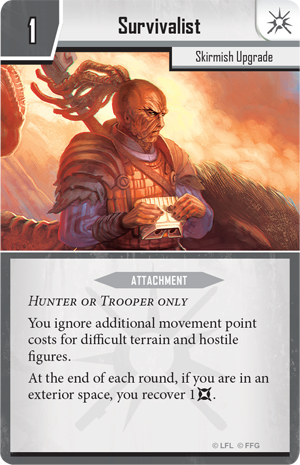 This Command card can only be triggered by a Trooper with a figure cost of four or higher, such as the elite Alliance Rangers, E-Web Engineers, or a unique figure like Kayn Somos, but its effects are undeniably potent. 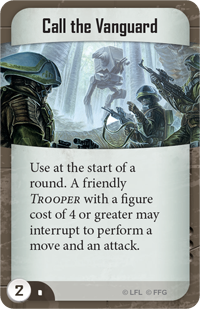 At the start of a round, the targeted Trooper can interrupt to perform a move and an attack! 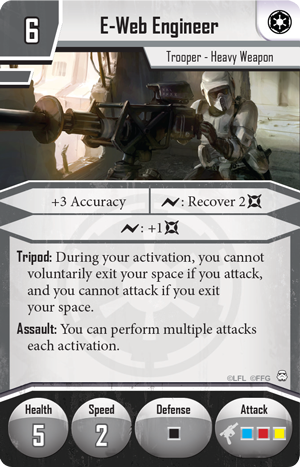 In a game where attacks are as valuable as in Imperial Assault, gaining another attack outside of your activations can be a powerful advantage, making it well worth including Call the Vanguard in your Command deck. 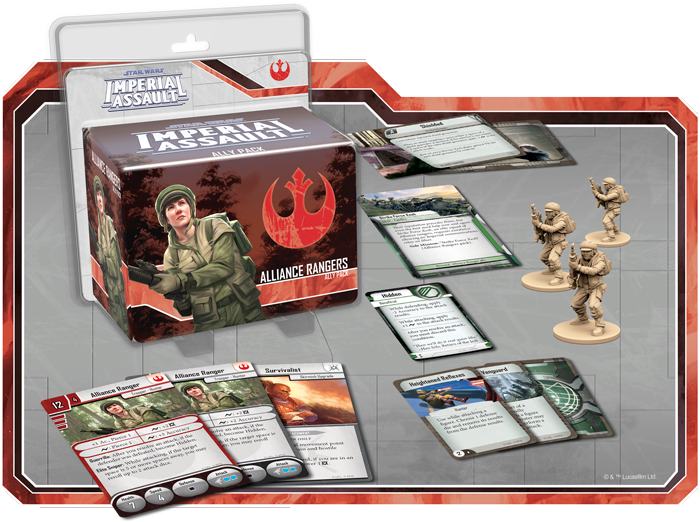 The Alliance Rangers are deadly long-range fighters, and they just might have a place in your campaign or skirmish game for Imperial Assault. Join us for our next article as we join the Imperial forces with the Captain Terro Villain Pack.